ReclaiMe Pro features a powerful tool set to work with data on a storage device, be it a single hard drive or a complex RAID, at the low level. 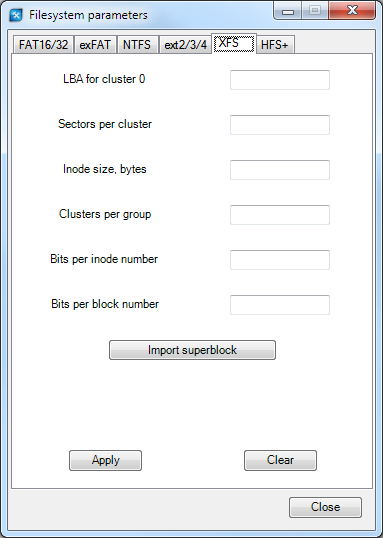 Disk viewer, built in ReclaiMe Pro, is able to represent in structured view more than 30 partition and filesystem objects such as MBR, GPT, APM, LDM, MD, LVM, boot sectors (FAT16/32, exFAT, and NTFS), NTFS MFT, XFS objects (superblocks, inodes, BMAP extent tree, XD2B, XD2D, XD2F, FEBE, D2FF, and D2F1 directories), EXT superblock, inode table, group descriptors, EXT folder, and HFS+ objects (volume header, catalog file, and extent overflow file). Additionally, ReclaiMe Pro disk editor (download) combined with smart navigation and search capabilities allows you to edit data on the device conveniently. Noticeably lighter than WinHex, ReclaiMe Pro disk editor still covers everything you need in your day-to-day data recovery routine. ReclaiMe Pro disk editor reads data from a storage device in pieces equal to the specified buffer size. The default buffer size is 4096 bytes; however, you can set an apropriate buffer size (up to 65536 bytes) yourself. The automatic recognition of metadata is enabled by default. When you click one of the displayed parameters on the right, on the left ReclaiMe Pro highlights the data area corresponding to the selected parameter. Note that some parameters can be colored in violet, meaning that you can double-click them and move to the location specified by this parameter. The View mode button is responsible for the analysis of structure. In the drop-down list of View mode you can either enable the automatic recognition (Auto select) or select one of the available structures. Note that the automatic recognition can change the buffer size to match the size of the structure. Towards the start of the disk (smaller LBA) or towards the end of the disk (larger LBA) - upward and downward arrows, respectively. Manually – you can specify the LBA number or the percent of offset from the beginning of the disk. Automatically by double clicking the structures marked in violet on the right window. Historically - using Back and Forward buttons you can navigate within the already seen LBAs. If one of the main filesystem structures (for example, boot sector in NTFS or superblock in EXT) is displayed, you can import the filesystem parameters for further use by clicking the FS params button. When you click the FS Params button, the window Filesystem Parameters appears showing you a tab with corresponding filesystem. To import filesystem parameters, click Import and then Apply. Importing allows a disk editor to calculate significantly more addresses for various linked filesystem objects. For each filesystem, there is its own set of parameters. You can also specify parameters at any time manually by clicking the FS params button. Text in one or several different encodings. For Unicode encoding, byte order mark is not included in the search sequence. The exact hexadecimal sequence in the 00 11 22 33 44 55 format. Both for the text and for the hexadecimal sequence, it is possible to specify offset in the sector. Objects from those for which there is a structured view (listed in View mode). Note that not all objects which disk editor can display are available for search due to the spesifics of the object structures. Some objects do not have good enough signatures. Once you specify the search criteria, click either Find next or Find previous to search the device starting from the current LBA towards to the end or to the beginning of the device, respectively. To edit data on the device, click Enable editing and put your mouse either in the field with hexadecimal data or text. Once you click Enable editing, ReclaiMe Pro tries to lock the device for editing. If for some reason it fails, for example in case of a system disk, you get a message that editing is not possible. If ReclaiMe Pro successfully locks the device, the Enable editing button is replaced by two buttons: Commit and Revert. All the changes you make are not written to the device immediately but are stored in a temporary buffer. Changed bytes are highlighted in red. You can discard the changes in the current buffer by clicking Revert. Once you decide to write the changes to the device, click Commit. Note that the temporary buffer is discarded every time you click Commit. If you clicked the Enable editing button in the current disk editing session, then, regardless of whether you actually have edited the data or not, when closing the disk editor window, ReclaiMe Pro re-scans all the devices once again and shows you the updated Disk and partition list.